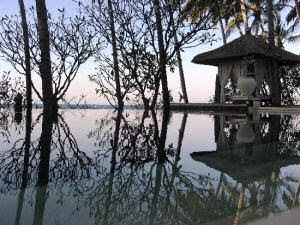 Go back to nature and 5 stars in the Spa Village Resort Tembok in Bali, Indonesia. the organic food served in the restaurant. I mean: if you indulge your body to the luxury of a spa but 1 hour later start stuffing your rejuvenated body with the same old unhealthy fast food and fuzzy drinks... I sure you get the picture. That's why I loved to eat in their restaurant as they focus on fresh, local, sustainable organic ingredients. And when you see that the fishermen keep their boats at only 50 meters away from the Spa Village Resort Tembok, you know you are not eating frozen fish that you could eat in any other hotel anywhere else in the world. Having spent more than a week here, it's just wonderful to be able to taste a new and fresh menu each and every evening and to enjoy a free yoga session each and every morning.